View Cart “Wampler Euphoria Overdrive Pedal” has been added to your cart. Bay Tunes Guitars is proud to be a MXR dealer. We have been selling and shipping artisan grade instruments and accessories since 2001. Fully insured ground shipping is always Free in the continental United States. A complete list of product specifications is listed below. Please reach out to us with any questions you have about this or any other awesome product we carry. THANK YOU! Categories: Jim Dunlop, MXR, Pedals & Accessories. 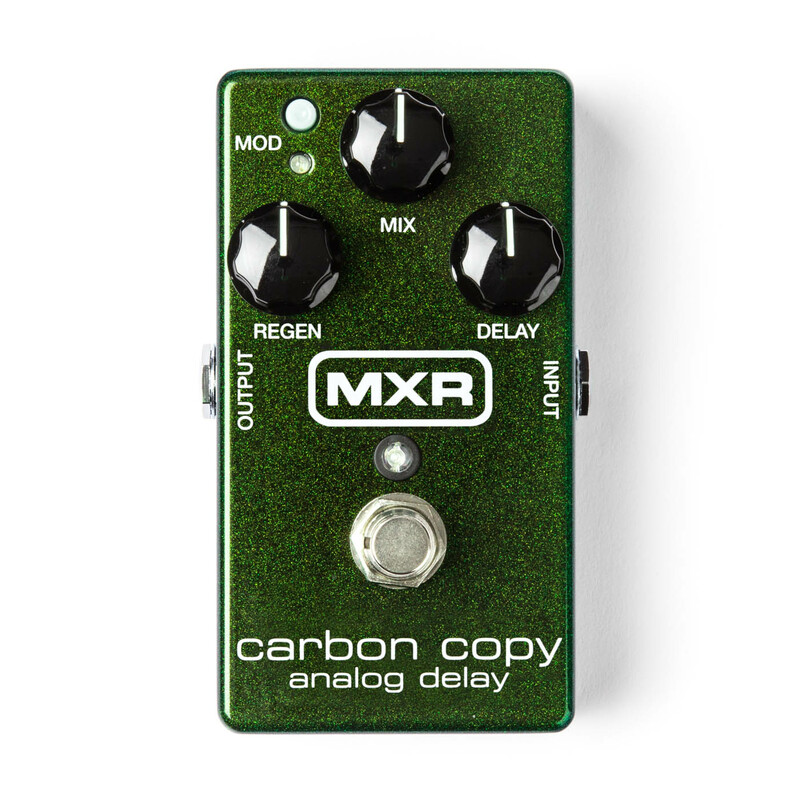 The MXR Carbon Copy Analog Delay Pedal features a completely analog audio path for the ultimate in rich, warm delay–made possible only by old-school bucket brigade technology. This design boasts an amazing 600ms of delay time with optional modulation via a top-mounted switch and a simple, three-knob layout that controls Delay time, Mix (dry/wet blend), and Regen (delay repeats)–all in a pedal no bigger than a Phase 90. In addition, the M169 pedal has two internal trim pots that offer user-adjustable width and rate control of the modulation for even more tonal options. The Carbon Copy effect pedal will take you from crisp “bathroom” slap echoes to epic, Gilmour-esque delays with a twist of a knob. True hard-wire bypass, single 9-volt operation, and stage-ready blue LEDs round out the package.